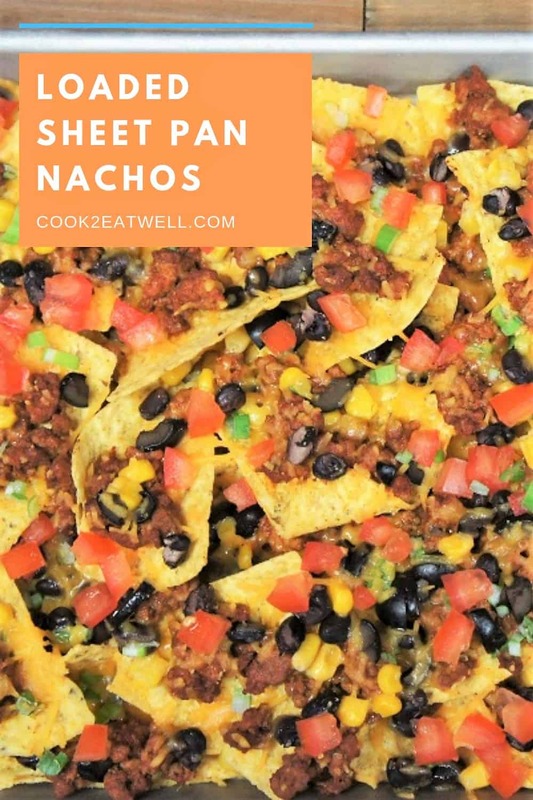 These loaded sheet pan nachos are easy to make and absolutely delicious. 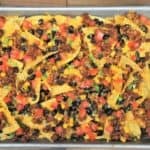 Corn tortilla chips are loaded up with flavorful turkey taco meat, black beans, corn, black olives, green onions, tomatoes, and of course, cheese. 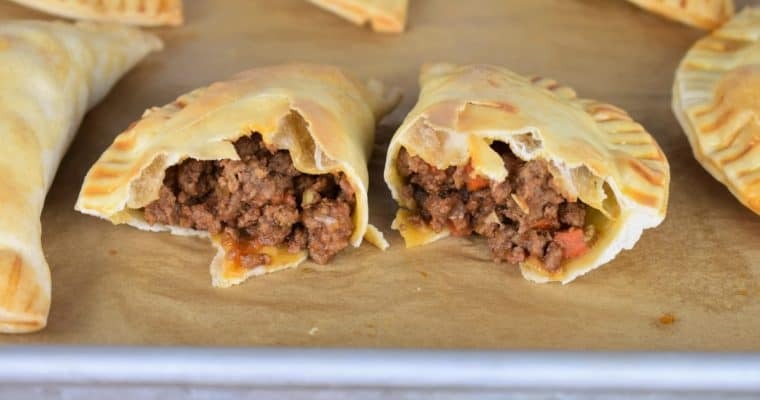 Serve them with some sour cream and an assortment of hot sauce on the side. This recipe makes a nice big batch so it’s perfect when you’re entertaining for game day, movie night or with some cocktails on the weekend. In a small bowl, mix together the chili powder, garlic powder, onion powder, cumin, salt, and pepper. Heat the canola oil in a large skillet over medium-high heat. Add the ground turkey to the skillet and sprinkle with the seasoning mix. Stir, to mix well. Cook the ground turkey until browned, approximately 4-5 minutes. Stir the turkey frequently, breaking up the pieces with a wooden spoon or spatula. Add the tomato sauce and the water to the skillet, stir well to combine. Lower the heat to medium-low, cover and cook about 20 minutes, stirring occasionally. I like to add the tablespoon of water to the empty can of tomato sauce and give it a quick swirl to get every last drop out. 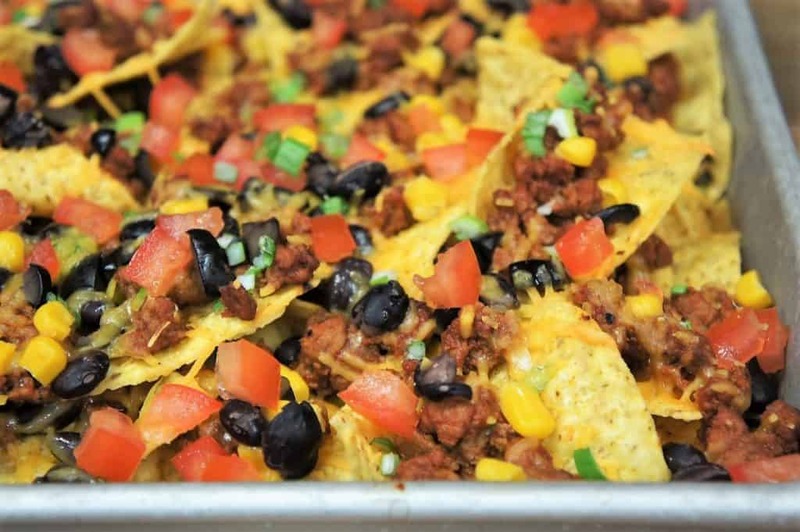 Add a layer of tortilla chips to a 9×13 sheet pan or shallow baking dish. Do not overlap the chips. Sprinkle about ½ the ground turkey over the tortilla chips. Sprinkle about half of the corn, black beans, black olives and green onions. Then top with about half the cheddar cheese. 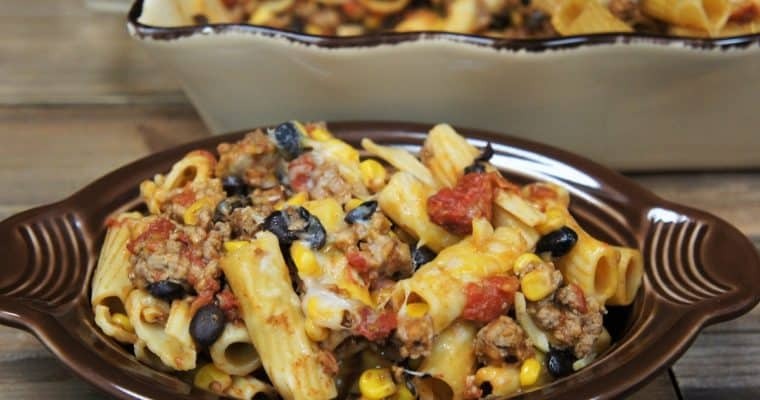 Add another layer of tortilla chips, and top with the remaining ground turkey, corn, black beans, black olives, and green onions. Add the remaining cheese. Reserve the chopped tomatoes and a few green onions to garnish when the nachos come out of the oven. Bake the nachos for 10 minutes or so, until the cheese is melted. Top with the chopped tomatoes and some extra chopped green onions, if desired. Serve the loaded sheet pan nachos with sour cream hot sauce on the side. Enjoy! Heat the canola oil in a large skillet over medium-high heat. Add the ground turkey to the skillet and sprinkle with the seasoning mix. Stir, to mix well. Cook the ground turkey until browned, approximately 4-5 minutes. Stir the turkey frequently, breaking up the pieces with a wooden spoon or spatula. 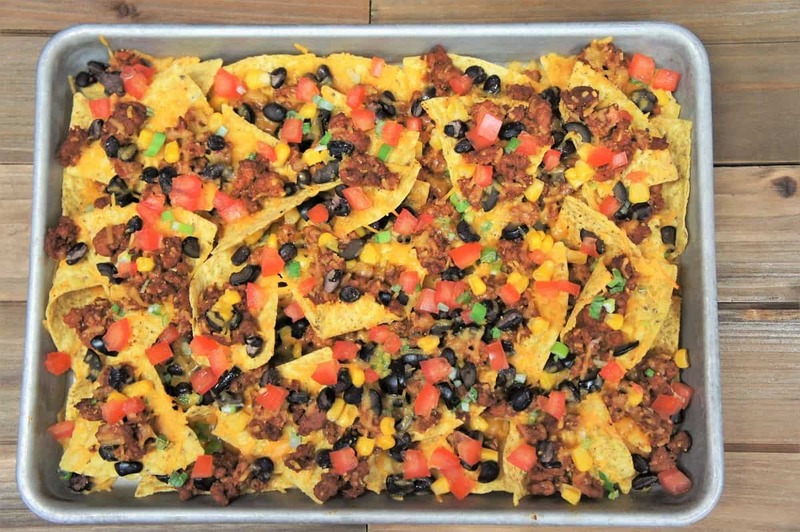 Add a layer of tortilla chips to a 9x13 sheet pan or shallow baking dish. Do not overlap the chips. Sprinkle about ½ the ground turkey over the tortilla chips. Sprinkle about half of the corn, black beans, black olives and green onions. Top with about half the cheddar cheese. Serve the loaded sheet pan nachos with sour cream hot sauce on the side.